Once again Vancouver has a new brewery! This time it is Main Street Brewing Company and they are located in the historic Brewery Creek District. 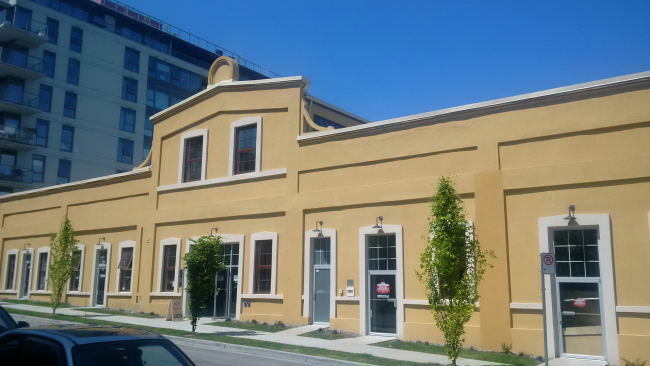 Main Street Brewing has acquired an amazing location in one of the few remaining heritage buildings in Vancouver. The outside looks brand new as can be seen but the inside has been left as original as possible! The taproom is a great mix of new and old with the old bricks and the new style bar. Even the bar has a mix of new school and old school with regular taps and 4 cask engines. From the sound of things there will be 3 to 4 casks on at most times pouring all kinds of either altered standard beers or one offs. There are also a bunch of food options from peperoni to some hot food options. After a sampling of the beer I headed over to take a peak at the brewery. The brewery is visible to the public from both the tap room and the growler filling room. Jack the brewmaster happened to be there when I stopped in so I had a chat with him. The brewery already has more tanks on order and they also ordered a brand new pilot system to brew crazy and interesting casks. Take a peak at the brewery. Once finished taking to Jack and checking out the brewery I took a stroll over to the growler filling room. The room is well laid out with lots of space for people. There is a large growler filling bar on one side while behind it they have a great setup with lots of swag to buy as well as a bunch of empty growlers for purchase. There is also a big cooler that I would assume will hold bottled beer when they are able to keep up with the demand for beer both in the growler filling bar and the tap room. It may be a while but bottles are definitely in the plans and will be on shelves as soon as they can manage to make enough beer! If you are in the Brewery District of Vancouver then you really should check out this brand new brewery. This entry was posted in Brewery and tagged beer, brewery, brewery creek, craft beer, growler filling station, jack, main street, main street brewing company, tasting room.